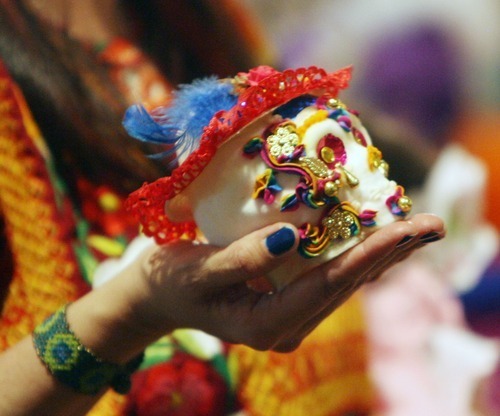 Holiday • Devotees of Day of the Dead hope celebrations connect others to their heritage. 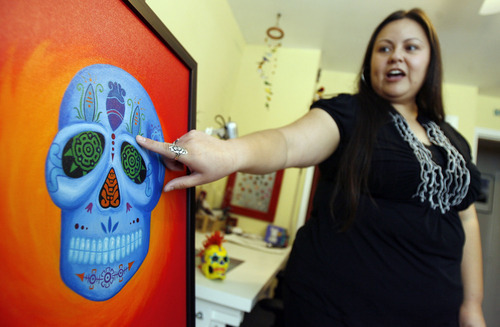 Francisco Kjolseth | The Salt Lake Tribune Local artist Veronica Perez points out the symbolism of her piece "hasta la muerte," which translates to "till death do us part" at her home studio on Monday, Oct. 24, 2011. The Day of the Dead holiday has helped her reconnect with her cultural roots. 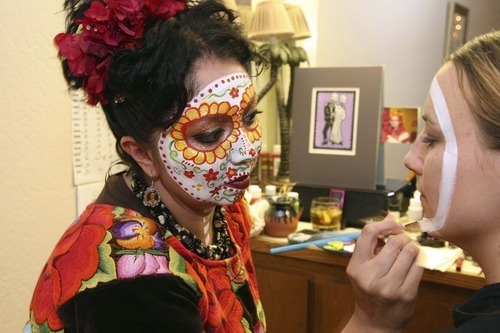 Marla Colmenero paints a girl's face in the tradition of the mythical La Catrina. (Courtesy photo by Robb Norbutt) Veronica Perez celebrates her Mexican culture through her Day of the Dead art that puts a modern spin on the traditional images of skeletons and skulls. 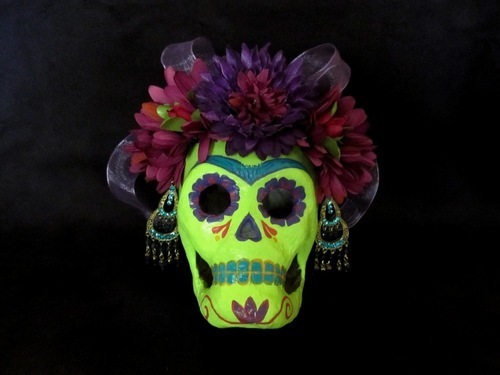 Courtesy of Veronica Perez Veronica Perez celebrates her Mexican culture through her Day of the Dead art that puts a modern spin on the traditional images of skeletons and skulls. Courtesy of Veronica Perez Veronica Perez celebrates her Mexican culture through her Day of the Dead art that puts a modern spin on the traditional images of skeletons and skulls. 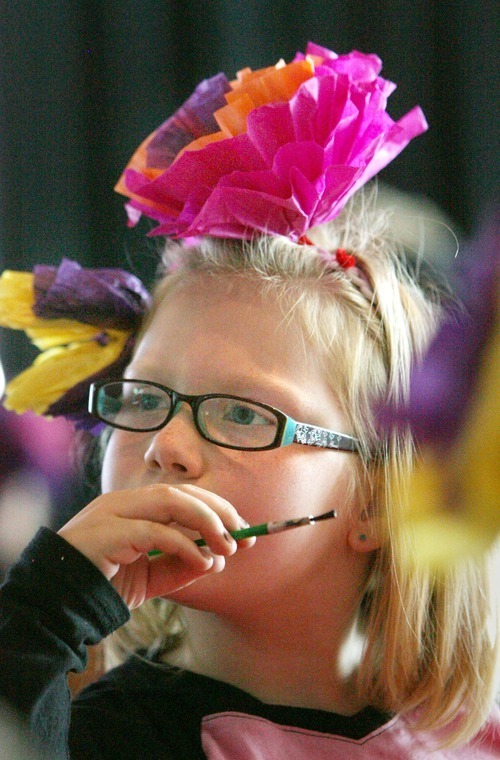 Courtesy of Veronica Perez Steve Griffin | The Salt Lake Tribune Mill Creek Elementary School second-grader Natalie Dahlquist wears the crepe paper flowers she made during her school's visit to the Utah Cultural Celebration Center's Day of the Dead Altar exhibits in West Valley City on Oct. 24, 2011. Steve Griffin | The Salt Lake Tribune Marla Lepe holds a decorated skull as she talks to Mill Creek Elementary School second-graders during the school's visit to the Utah Cultural Celebration Center's Day of the Dead Altar exhibits in West Valley City on Oct. 24, 2011. The exhibit runs through Nov. 3, 2011. Steve Griffin | The Salt Lake Tribune A skeleton hangs from the ceiling at the Utah Cultural Celebration Center's Day of the Dead Altar exhibits in West Valley City on Oct. 24, 2011. The exhibit runs through Nov. 3, 2011. 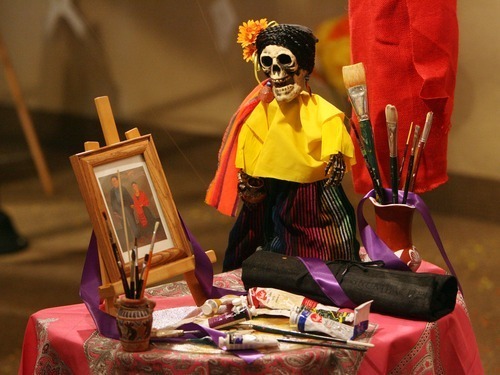 Steve Griffin | The Salt Lake Tribune A memorial to the famous painter, Frida Kahlo, is part of the Utah Cultural Celebration Center's Day of the Dead Altar exhibits in West Valley City on Oct. 24, 2011. The exhibit runs through Nov. 3, 2011. 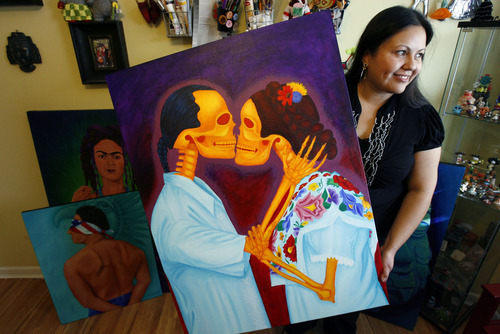 Francisco Kjolseth | The Salt Lake Tribune Local artist Veronica Perez holds her painting "El Beso" or "The Kiss," which depicts an image from her marriage done in the style of the Day of the Dead holiday. Perez has playfully also taken the images and concepts of the holiday a step further with a modern spin, which has helped her reconnect with her cultural roots. 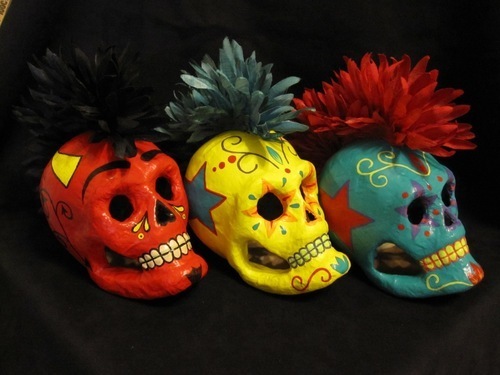 Francisco Kjolseth | The Salt Lake Tribune Veronica Perez is a Utah artist who has playfully taken Day of the Dead images and concepts of the holiday a step further with her modern spin -- punker skulls, etc. -- and reconnected with her cultural roots through the imagery of the traditional holiday. Artist Veronica Perez, like many first-generation Mexican-Americans, found little outside her home to connect her with her cultural heritage. As a little girl, the annual Mexican holiday Day of the Dead, with its brilliant colors, butterflies, flowers, earthy humor and skulls, caught her attention and offered a vivid link to her roots that she actively continues through her work. "It was a holiday I identified with because it emphasized the mix between the indigenous and the Catholic holidays," she says. "Growing up in Utah, I felt I was missing out on my culture and history." In Perez's studio in South Salt Lake, the walls are crowded with paintings of Mexican cultural icon Frida Kahlo and tiny folk-art figurines. 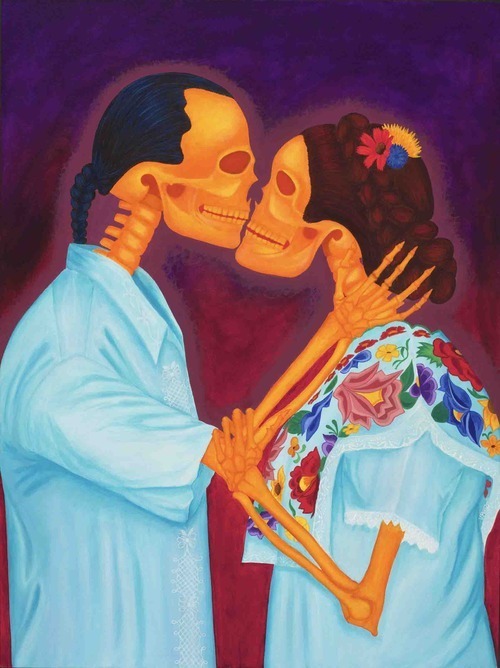 There's even a cheeky self-portrait of Perez and her husband kissing  as skeletons, of course. Californian Christine Vega, who is organizing a Day of the Dead display at the Mestizo Coffee House and Gallery on Salt Lake City's west side, is a graduate student in education at the University of Utah. "I didn't grow up with this culture," Vega says of the altar de muertos and other traditional decorations in the Mestizo Gallery. "My family immigrated in the early 1970s and they left this tradition behind." Vega was a troubled teen in the San Fernando Valley, but "when I started to learn about Día de los Muertos in high school, it literally saved my life." The two women are hoping other disconnected Latinos will take advantage of Día de los Muertos, celebrated Nov. 1 and 2 in connection with the Catholic holidays of All Saints' Day and All Souls' Day, to trace their heritage not only to Mexico, but beyond the Spanish Conquest to the Aztecs and other indigenous Mexican cultures. Americans sometimes confuse the Day of the Dead with Halloween, which precedes the Mexican holiday on the calendar. But devotees of the Day of the Dead say the two celebrations have little in common besides a few skeletons and Halloween's distant religious connection. Memorial Day, which in Utah includes traditions of honoring the dead and even picnicking by the graves of departed loved ones, is probably a better comparison to Día de los Muertos, which celebrates a time when the beloved dead return to visit with the living. 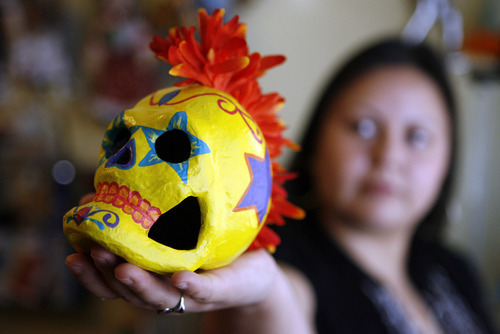 "The Day of the Dead is a fiesta, but at the same time it is a way to grieve those who have died," says Rocio Mejia, who has organized the altars and decorations at the Utah Cultural Celebration Center in West Valley City the past eight years. Vega will have a cup of coffee on her altar, prepared just the way her grandmother loved it, "because Grandma is coming back to visit." The holiday is a way to "honor and remember those who have gone," Vega says. "It's not just about death. It's about life and the celebration of life." The holiday isn't frightening or ghoulish like Halloween, Perez says. "I love the idea that death is not something to be feared. It's a beautiful way to celebrate life. It's a cycle," she says. "It's a way to connect with our ancestors and it's a way to keep those who have passed close to us." Día de los Muertos celebrations vary with the regions of Mexico, and Perez, who makes and sells Day of the Dead art, may be at the beginning of a Utah version. "I try to be playful," she says of her art. "But it's a modern spin on the folk crafts. I use less traditional materials." Where in Mexico yellow marigolds are a death symbol, Perez chooses silk flowers to create mohawk haircuts on her punk-influenced papier-mâché skulls. "You don't see that in other places," she says. The artist plays with indigenous, pre-Columbian symbols and glyphs in her skulls and other works. A rattlesnake's skeletal rattle symbolizes the holiday's noisemakers, the voice, and also fertility. A human heart represents passion and love. Perez and Vega appreciate that the roots of Day of the Dead, unlike Halloween, haven't been lost in an avalanche of commercialism. 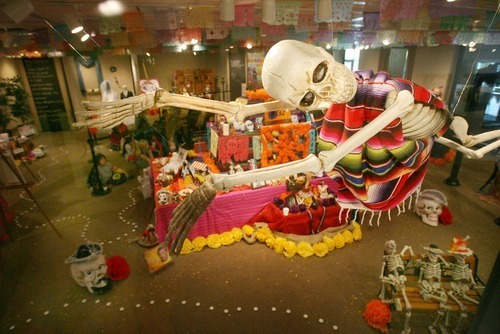 People still prefer handmade decorations and food, including altares de muertos that come in all sizes; calacas, cartoonish skeletons; careta masks; pan de muerto bread; and, of course, La Catrina, the female skeleton central to Día de los Muertos celebrations. The legend varies, but in most stories La Catrina was a bride left at the altar, says Michael Christensen, folklorist at the Cultural Celebration Center. "She keeps coming back for her groom." Enrique Sosa, West Valley's diversity services specialist, has a slightly different spin on the opulent La Catrina. "She is the glamorous dead," he says. "Well dressed. Beautiful." The point: No matter how beautiful, death takes everyone in the end. In her own home this year, Perez is planning a "mellow" Día de los Muertos. "We're going to keep it intimate this year." Vega will celebrate by reintroducing Latinos to the Day of the Dead. "My commitment is to pass on what I've been taught. This is how I survive in Salt Lake City." Mejia, who grew up in Morelia, Michoacán, where Día de los Muertos traditions remain very strong, plans to continue educating Americans and Mexican immigrants to its traditions. She will honor her late father by putting his favorite meal  chile rellenos, rice and beans, topped with a sunny-side-up fried egg  on the family altar. "When I came to the USA, not only did I come myself, I brought my culture with me. This is who we are." P The Utah Cultural Celebration Center holds a Día de los Muertos or Day of the Dead fiesta, which will include dancers, food and music. When • Wednesday, Nov. 2, beginning at 6 p.m. Altars and decorations are on display through Thursday, Nov. 3. Where • Utah Cultural Celebration Center, 1355 W. 3100 South, West Valley City. Also • Altars and other traditions of the Mexican holiday will also be on display at the Mestizo Gallery, 641 W. North Temple, Salt Lake City. Art works • Veronica Perez will sell her work Nov. 6 at Craft Sabbath at the Salt Lake Main Library, 200 E. 400 South. The sale of crafts by local artisans takes place on the first Sunday of each month.